Winter is coming and it is time to get cosy, but how can we look cosy and stylish at the same time? Over-sized sweaters are bulky, homely, and seem so unappealing to the figure – well, here you are wrong. In fact, there are some creative and tasteful ways you can pull off this new warm look. Although this ‘over-sized-sweater trend’ sounds easy to accomplish, you can’t just throw on any old roomy knit. You need a style that doesn’t make you look like you’re wearing well-worn baggy potato sack. I have styled looks below for you to flick through to get that mind of yours rolling. This baggy human blanket is hitting the new heights of fashion this season, so ask yourself, do you want to be layered and uncomfortable, or layer and feeling cosy and warm? Take a look at the images provided below, think out of the box and scramble through your wardrobe for the sweater your grandma knitted you five years ago – because that sweater IS in style my fabulous fashionistas! Nothing is more practical during a blistering chilled winter than a comfy sweater that can fit two of you in it. Designers Maxwell Osborne and Dao-Yi Chow recently showcased some of their jumpers at New York Fashion Week. If you are a down town girl and want something warm, these designers have it sorted for you. The jumper designs even by Zimmerman were displayed as something so warm you don’t need to wear anything underneath – you could almost call their sweaters massive winter dresses. Boots/flats, a neat scarf and an over-sized side bag does the job for this seasons look at New York Fashion Week Fall/Winter 2014! Some fashion bloggers have stumbled upon this trend and have managed to pull it off with flair. This season’s colour selection is visually quite wild – you can go from graphic print to natural knit, mixed textures and so on. In these images, the shoe selection is more up town with a stiletto point heel and ripped boy jeans. In the second image, slimming pants/leggings, wearing neutral colours with a bold jersey colour stands out mildly – a mustard yellow, (depending on the right skin tone) can be pulled off with navy blues, blacks, burgundy reds and camo rustic greens. To add sophistication to the style, a straight hat and bold gold accessories can be added for a better visual performance. 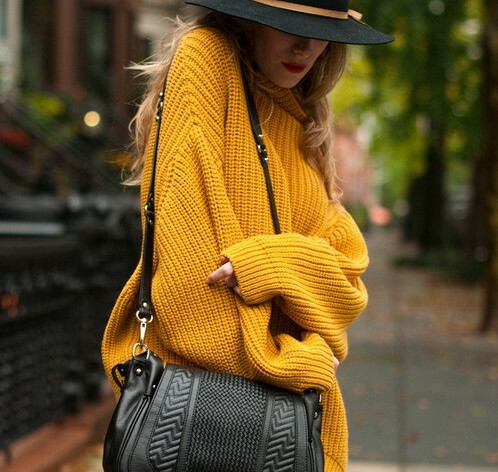 Looking your best on the street in an over-sized sweater is a challenge that can fortunately be pulled off! Designer Karen Walker displays versions of her way to wear over-sized sweaters that crop at the hip which is a common 60’s inspired crop line. She has casually dressed these styles up in more of an urbanized school girl style which will attract an understandable audience. Over-the-knee swing skirts and baggy almost-fat-pant-styled bloom trousers with again, sensible booties, knocks the ball out of the park when trying to achieve this look! If the sweater is a low neck style, you can dress up the collar with a scarf, or a cute peter-pan collar. Presented to you, are the top looks on how to stylize and pull off your next over-sized sweater trend this Fall! It’s time to get cosy!